Developed by Astro-Tech to make large-aperture/large-format CCD imaging affordable for the dedicated amateur astronomer and educational institution, the 12” Astro-Tech AT12RC – a Sky & Telescope Hot Product for 2011 – is priced thousands of dollars less one competitor’s 10” R-C! The Astro-Tech AT12RC is truly the first affordable 12” true Ritchey-Chrétien astrograph. The AT12RC is supplied without focuser to allow the astro-imager to use an existing focuser or add a premium focuser (FeatherTouch, MoonLite, etc.) of his or her choice. The 12″ Astro-Tech AT12RC is the first 12″ true Ritchey-Chrétien astrograph available at a reasonable price. Named a Sky & Telescope Hot Product for 2011, it joins the line-up of other Astro-Tech Ritchey-Chrétien astrographs that have previously been honored by Sky & Telescope (the original Astro-Tech 6″ R-C was named a Hot product for 2009 and the Astro-Tech 8″ and 10″ R-Cs were named Hot Products for 2010). The Ritchey-Chrétien optical design is used in virtually every recent large mega-million dollar professional observatory telescope – including the Hubble Space Telescope. The Astro-Tech AT12RC astrograph makes the coma-free imaging of true Ritchey-Chrétien imaging optics available to the DSLR and large format CCD astrophotographer at a price less than that of many large format CCD cameras by themselves and even less than some DSLR camera bodies. Featuring first-quality 99% reflectivity dielectric mirror coatings and premium low thermal expansion quartz mirrors, rather than aluminized Pyrex glass mirrors, this reasonably-priced 12″ Astro-Tech R-C makes you wonder just what competitive high-price R-Cs have that makes them cost so much more. Designed for exceptional imaging, the Astro-Tech AT12RC provides the coma-free photographic field that large format CCD astrophotographers crave, but can’t get from conventional reflectors and Schmidt-Cassegrains. 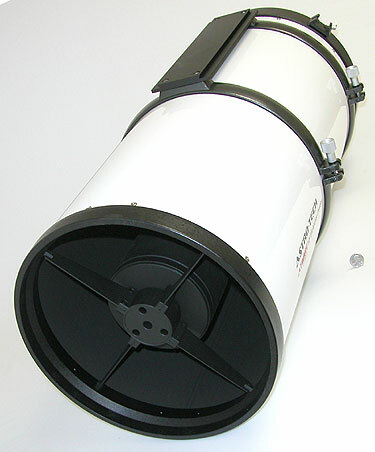 Likewise, as a pure two-mirror system, the AT12RC has a wide spectral response and is totally free from the spurious color that affects the imaging of all but the most costly apochromatic refractors, and it does it with an 12″ aperture that dwarfs the light gathering of virtually every commercially-available apo refractor. In the “Feature Images” section below is a first light AT12RC image of M51 taken by Preston Starr, Observatory Manager of the Astronomy Program at the University of North Texas. Preston shared these comments with us when he sent in the image: “The conditions for imaging were really bad . . . but I thought the AT12RC really performed! Location: ‘Astronomers by Necessity’ observatories; 5 miles southeast of Necessity, TX; 100 miles west of Ft. Worth, TX. Conditions: Poor seeing, poor transparency due to 25~45 mph winds and dust. Telescope: AT12RC F8 (No Field Flattener). Camera: Atik 4000 OSC CCD. Exposure Details: 10 minutes each, 31 images, cooled -15c. Capture with MaxImDL, processed using bias, darks. IP processing by Don Waid.” Our congratulations to both Preston and Don for their very good first light image, despite the very poor imaging conditions. If serious astrophotography is your goal, but the price of most true Ritchey-Chrétien optics has been keeping you from the optical design most modern professional observatories and the Hubble Space Telescope use for their imaging, your wait is over. 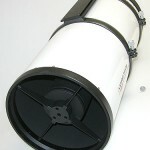 The 12″ Sky & Telescope Hot Product for 2011 Astro-Tech AT12RC astrograph can bring the world of professional DSLR/CCD deep space imaging to your backyard observatory at a truly affordable price. Features of this Astro-Tech AT12RC Astrograph . . .
Optical design: true Ritchey-Chrétien Cassegrain-type two-mirror optics, with hyperbolic primary and secondary mirrors. For more details, click on the “optics” icon above. The 288mm available back focus allows for the use of long CCD equipment trains. Optical specifications: 12″ aperture, 2432mm focal length, f/8 focal ratio. Hyperboloid primary mirror: Made of low thermal expansion quartz. Ground and polished under precision computer control. Unlike catadioptric designs (SCTs, Maksutovs, etc.) that move the primary mirror fore and aft in the optical tube to focus (which can lead to image shift as the mirror position changes) the AT12RC primary mirror is fixed to eliminate both a catadioptric’s image shift and the frequent primary mirror collimation requirements of a Newtonian reflector. Focusing is done by means of an optional external focuser, discussed below. Primary mirror collimation is pre-set at the factory, but can be adjusted if needed using three traditional push/pull locking adjustment screw sets. 99% reflectivity dielectric coated optics: Both primary and secondary mirrors have non-tarnishing state-of-the-art multi-layer dielectric mirror coatings. These have a full 99% reflectivity for the brightest possible images. This is higher than the often unspecified (but typically about 96%) reflectivity of the enhanced aluminum coatings used by competitors. No focuser is supplied: Many astro-imagers already have a premium focuser being used on another scope that they would like to use for imaging, or they have a preference for one particular focuser manufacturer over another. Rather than pre-installing a focuser of our choosing, and to give you the most flexibility in choosing your own focuser for imaging, no focuser is supplied with the AT12RC. This allows you to choose your own focuser, depending on your preferences. One possible choice might be the dual-speed 3″ Feather Touch #3015 rack and pinion focuser. The rear cell of the AT12RC has a male 117m x 1mm pitch threaded port for attaching a focuser. The standard Feather Touch 3″ diameter 1.5″ travel focuser normally comes with a 109mm threaded collar for connecting to a scope. However, in its #3015 configuration (Feather Touch part #FTF3015B-A), it requires an optional #M117x1 Feather Touch adapter to be used with the AT12RC. The #3015 focuser (without 109mm collar) slips into this adapter and is held in place by three large brass Delrin-tipped retaining knobs. Only focusers with a maximum 1.5″ drawtube travel, such as the Feather Touch #3015, are recommended for use with the Astro-Tech AT12RC 12″ Ritchey-Chrétien. For brands of focusers other than Feather Touch, such as MoonLite, contact the focuser manufacturer for an adapter to fit the 117mm x 1mm port on the rear of the scope.To fine-tune the 288mm back focus of the AT12RC to the requirements of your camera and equipment train, two threaded extension rings (each 2″ in length) are provided to thread singly or in combination between the 117mm port on the AT12RC rear cell and the focuser of your choice. These provide a flex-free solid metal extension that changes the distance between your chosen focuser and the rear cell. This lets you accommodate the varying back-focus requirements of DSLR-type camera imaging versus long equipment train CCD imaging. Each 2″ x 117mm diameter threaded ring weighs 14.4 ounces. Because of the 41.5 pound (18.9 kg) weight of the AT12RC (without rings, dovetails, or focuser), plus the weight of your ancillary camera equipment and any photoguide scope, installing the AT12RC on a German equatorial mount with a 60 pound (minimum) to 100 pound or greater payload capacity is recommended. Such mounts include the 90 pound capacity Celestron CGE Pro and the Losmandy 60 pound capacity G11 or G11 go-to and 100 pound capacity Losmandy HGM Titan. Other suitable mounts are also available. Cooling fans: To allow the AT12RC to reach ambient temperatures more quickly for optimum imaging performance, there are three small low vibration/high CFM primary mirror cooling fans built into the rear cell. The high speed DC fans are powered by a standard equipment battery pack that plugs into a jack on the rear cell. The battery pack uses eight user-supplied AA batteries. An optional external DC power supply, such as a rechargeable 12VDC battery pack can also be used to power the fans. Split rings and two dovetail mounting rails: Dual split hinged mounting rings, joined by two 14″ Losmandy-style “D-plate” dovetail rails bolted to the rings, are provided for installing the AT12RC on an equatorial mount, as well as for mounting optional accessories (such as rings for a photoguide scope) on top. The rings are positioned so that one rail is underneath the 14.3″ diameter by 34″ long (without focuser) optical tube for installing the AT12RC directly on a suitable payload capacity equatorial mount. The second rail, 180° away from the first, will then be on top of the tube for installing a photoguide scope or any other accessory that attaches to a scope by means of Losmandy-style “D-plate” dovetail adapters. The undersides of the dovetails have been hollowed out to lighten their weight without compromising their strength. The rings and dovetails have a combined weight of 7.8 pounds (3.55 kg). Finderscope dovetail: A Vixen-style finderscope bracket dovetail base is installed on the upper left side of the optical tube rear cell. It can easily be removed if not needed. It will accept Vixen-style finderscope brackets as well as red dot-type finders, such as the Astro-Tech #ATF. Two year warranty: As an expression of the confidence Astronomy Technologies has in the quality of their products, the Astro-Tech AT12RC is protected by a two-year limited warranty against flaws in materials and workmanship.